Following a recent review of Maersk Line’s Asia to North Europe Service network, they have now confirmed the new transit times for all export cargo, which are effective immediately. Their drive is to ensure they continue to deliver optimal results on both service stability and schedule reliability. Whilst transit times have been slightly extended for some destinations, Maersk Line wishes to assure that they have worked to protect the main entry points for your cargo. Listed below key destinations with the adjusted transit times, along with destination arrival day. 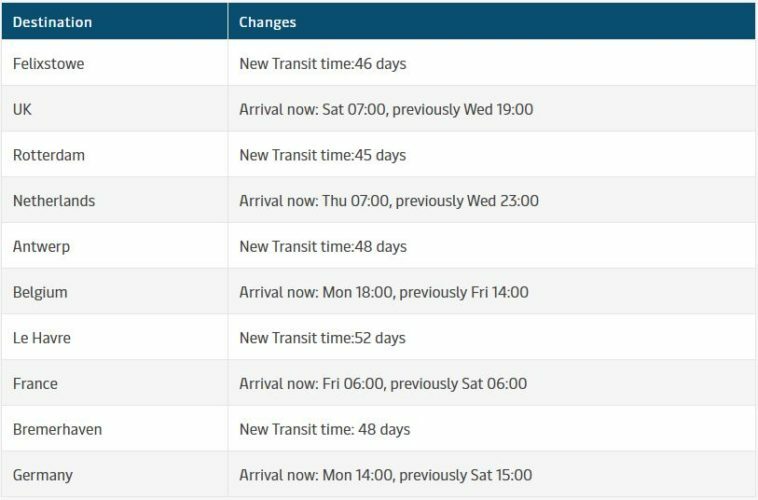 To find transit times for specific port pairs not shown, please contact your local Maersk representative or visit Maersk.com to check schedules and make a booking. If you have any questions or concerns, please do not hesitate to contact us on 0800 623775.